Spend a fun day with the special mom in your life at the Milwaukee County Zoo on Sunday, May 13! All mothers receive free admission, courtesy of Roots Salon. Guests can enter to win one of four $100 Roots Salon Gift Cards and spin a wheel to win amazing prizes. Free glitter hairspray will be offered to the little ones (and Mom, too!) to make their visit fun AND fancy! Join us on this day for a special event called “M.O.M.,” (Missing Orangutan Mothers) in the Primates of the World building. Primate zookeepers and Zoo Pride volunteers will host activities bringing attention to the crisis facing wild orangutans, and what can be done to help conserve this precious great ape species. Visitors will learn more about the effects of non-sustainable palm oil production on the orangutan’s rainforest habitat through children’s activities, conservation information and craft items for sale to support orangutan rescue and rehabilitation. Orangutan Outreach and annual M.O.M. events. The event honors the long-lasting and close bond that forms between orangutan mothers and their offspring. Young orangutans typically stay with their mothers until around 8 years of age. Palm oil is found in many common cosmetics, lotions and foods, and the growing demand for these products could mean extinction of wild orangutans. Their rainforest homes are being destroyed to create more space for palm oil plantations, leaving thousands of orangutans in need of critical medical care, long-term housing and rehabilitation. Conversion of tropical forests to palm oil plantations has a devastating impact on other species as well, including Asian elephants, Sumatran rhinoceros and tigers. Palm oil production can be done more responsibly, in a way that minimizes the impact on orangutans and other species that call these forests home. During the M.O.M. event, learn about items containing sustainable palm oil that you can look for on your next shopping trip. Find out which national brands have joined the Roundtable for Sustainable Palm Oil (R.S.P.O. ), and which companies are looking to participate in the future. See how you can help wild orangutans by knowing the source of the palm oil in the products you use in your daily life. Children can also create a fun monkey mask to wear during their visit to the Zoo. 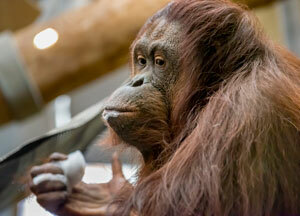 Activities take place from 9 a.m. to 3 p.m., and proceeds benefit Orangutan Outreach. NEW THIS YEAR! Get a FREE Carousel ride on Mother’s Day with a receipt showing the purchase of any Roots Salon service. The Zoo is open on Mother’s Day from 9 a.m. to 4:30 p.m. Milwaukee County residents with I.D. 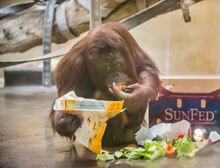 receive $1.75 off regular Zoo admission. 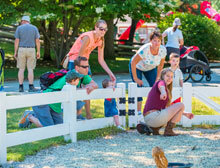 Regular Zoo admission is $15.50 for adults, $12.50 for children ages 3 to 12, $14.50 for seniors age 60 and over, and free for children 2 and under. Parking is $12. For more details, call the Zoo at 414.771.3040.